Hostwinds Review 2019: Is Hostwinds a Good Hosting? Hostwinds is a fast-growing web hosting service that offers flexible shared hosting plans along with dedicated servers and website builder tools, all supported by an excellent customer service team and on-site technicians. With unmatched customer support and a number of feature-rich shared hosting packages and customizable dedicated servers, Hostwinds has curved a niche for themselves in a fast-changing hosting landscape. This American web hosting company was founded in 2010 and has offices located in Tulsa, Oklahoma, as well as Seattle, Washington. The dedicated IP address was definitely a nice perk — very rarely will you see a hosting provider offer this with their shared hosting packages. This dedicated IP address prevents some of the major downsides of shared hosting. For instance, there’ll be a lower likelihood of your email being marked as spam by recipient servers, better data security for your customers, and even the enablement of a few third-party apps that require it. Even better: Hostwinds has gone above and beyond in offering their Business shared hosting customer base a 99.999% uptime guarantee. 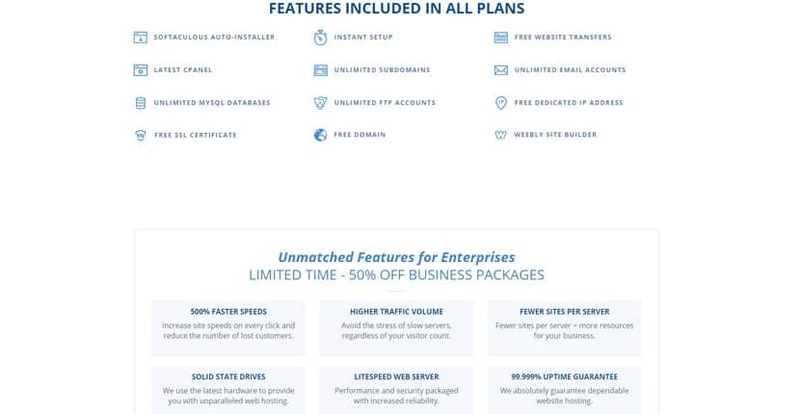 These plans — ideal for startups all the way to mid-sized companies — feature the LiteSpeed Web Server and operate up to 500% faster than their regular shared hosting packages. If none of their shared hosting packages can accommodate your enterprise-scale operational needs, check out their dedicated servers instead. You get powerful machines with no restrictions on bandwidth in addition to geo-specific IP addresses and their trademark 99.999% uptime guarantee. Equipped with either SSD or Enterprise HDD storage, you can choose from several server series such as the E3-1270 v3, 2 x L5420, and 2 x 6272 that will ensure all the heavy traffic and workload of your website is handled smoothly. OS-wise, you have options such as Ubuntu, Windows Server 2016, CentOS, and Fedora. To top it all off, their technicians fully manage and fine-tune your servers for performance, so you’ll never have to worry about downtime. If you’d rather have something that’s in between shared and dedicated hosting, take a look at their cloud hosting solutions. They are very secure and come with reliable SSD and HDD storage options. You can set up yours within minutes by selecting the OS of your choice and then deploying your server at the location of your choice. Other than the OS, you can also choose from a list of pre-installed apps or import some of your own templates when creating your cloud server. And so, in a matter of minutes, you can have your website or application up and running with no hassle at all. While most companies in the industry overcharge their clients for substandard services and customer support, Hostwinds has consistently kept their prices low while at the same time delivering premium services. And to show just how confident they are about their products, they give you a refund within 60 days if you’re not satisfied with their services. This money back guarantee applies only to their shared, business, and reseller hosting services. With 24/7 support, Hostwinds allows you to rest easy knowing help is just a phone call, email, or live chat away. You can also open a ticket and request for support. They have friendly technicians and system engineers who handle software upgrades, server maintenance, and hardware replacement in a timely manner. onClick="trackClickout('event', 'clickout', 'Vendor Page - Visit User Reviews', 'Hostwinds', this, true);"
I've been using Hostwinds shared hosting account based on SSD storage for over three months. In today’s Internet market it is not unusual for individuals and corporations to own dozens or even hundreds of domains. Finding a host that can provide a hosting package to meet the needs of everyone, big or small can be difficult. This hosting provider has stepped up to meet the challenge. I have been with Hostwinds for some time, and have some servers with them. I am pleased that it takes such short wait for the server reboot and technical support. Thanks a lot for your unmatched services! The best and most reliable hosting provider they are! So far my experience of Hostwinds has been very positive - especially with their very helpful, very fast, and so far 100% effective support.Work perfectly well for me. They know what they are doing and in a quality manner. Want to say they are really good. I haven't ever had a technical problem. I've only had a few minutes of downtime in last ten months. The technical support is responsive to extremely basic and simplistic questions. If you need to ask any questions out of ordinary you're on your own. If you’re looking for a premium hosting service that won’t burst your budget, Hostwinds is the place for you. Their excellent customer support and fairly-priced packages are perfect for personal blogs or business websites of all sizes. Wondering how Hostwinds stacks up against other Web Hosting companies? Enter any other Web Hosting company and we will give you a side-by-side comparison.